When Oconee County voters go to the polls for the Nov. 4 election they will be asked to vote Yes or No on a 1 percent sales tax that, according to the ballot language, is expected raise $55.6 million over the six-year life of the tax. Voters also will be presented with list of projects to be funded, including water and sewer infrastructure, roads, farmland protection, libraries and parks and recreational facilities. An analysis of collections from the current 1 percent Special Purpose Local Option Sales Tax shows that the county will have to experience strong growth rates to realize that $55.6 million goal. The county’s revenues from the current SPLOST have fallen far short of the projected $40.4 million. Because of that shortfall, the Board of Commissioners this year decided to reallocate revenue from one spending category to another within the list of categories approved by voters in 2009. If the commissioners follow that same policy for the new SPLOST, it could mean that the categories listed on the ballot in November are only an indication of the types of spending that will be done, not the amounts per category. The Georgia Department of Revenue distributes sales tax revenues to the counties on a monthly basis, and those distributions are downloadable from the Department’s web site. The distributions lag actual collections by a month, meaning that a January distribution is for December sales. In addition to the monthly distributions, the state makes what it calls a pro-rata distribution, usually on a quarterly basis, of monies for one reason or another not included in the monthly distribution. 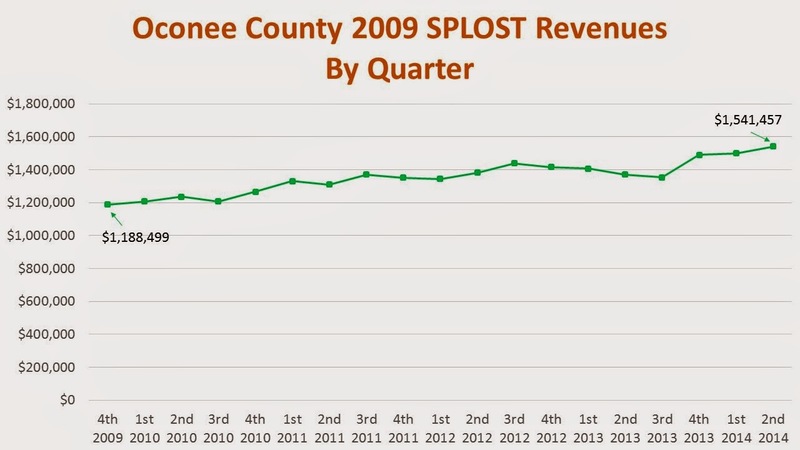 In the figure below, the distributions are shown by quarter for the 2009 SPLOST, which Oconee county began collecting in the final quarter of that calendar year. In the second quarter of this year, the county received $1,541,457 in SPLOST Revenue. The third quarter is not yet complete. Revenue grew in 10 of the 18 quarter-to-quarter comparisons shown in the chart, and declined in the other eight. The average rate of growth across those 18 comparisons was 1.51 percent. In the last three quarters, however, growth increased more strongly. From the third quarter of 2013 to the fourth quarter, growth was a dramatic 10.11 percent. In the following quarter, it was only .72 percent, but it was 2.72 percent from first quarter to the second quarter of this year. The average rate of growth across the last three quarters was 4.52 percent. If revenue grows at 1.51 percent for the last five quarters of the 2009 SPLOST and then continues to grow at that rate for all of the 2015 SPLOST, the county would collect $48.3 million during the six-year run of the tax. If revenue grows at 4.52 for the remainder of the 2009 SPLOST and then grows at 1.51 percent for the run of the 2015 SPLOST, the county would collect $56 million from the tax, or roughly what is listed in the ballot language. If revenue grows at 4.52 percent for the remainder of SPLOST 2009 and at that same rate for all of SPLOST 2015, the county would collect $84 million. That kind of a growth rate is unlikely. The discrepancies in these predictions--as well as the fluctuations in growth rates shown in the chart above--indicate how much guesswork is involved in calculations of the estimates of revenue to be generated by the proposed tax. County Finance Director Wes Geddings provided the estimate of $55.6 million released to the public during the runup to the vote by the BOC that put the referendum on the ballot in November. Geddings did not reveal the assumptions behind his estimate. It is quite reasonable to expect that the growth would at least keep up with inflation. The Bureau of Labor Statistics calculation of the Consumer Price Index for Urban areas for the past 12 months is 1.7 percent, but the CPI-U for August actually had declined 0.2 percent from a month earlier. The CPI-U had been 1.5 percent in the 12 months ending in August 2013. These suggest a growth rate projection of 1.51 is reasonable, and that, with continued growth in the county’s Epps Bridge Parkway and Butler’s Crossing commercial sectors, a higher growth rate is possible. To get to the $55.6 million projection, that stronger growth rate will be needed. The November ballot does not detail spending by category for SPLOST 2015, but the notice given to the Board of Elections and Registration does, reflecting the resolution passed by the Board of Commissioners in approving the referendum on Aug. 5. The minutes of the Aug. 5 meeting on the county web site don’t include the list, but the minutes of the May 21 work session do, as does a special page about SPLOST 2015 on the county web site. Both the notice to the Board of Elections and Registration (as well as the special page on the county web site) list the amount of money going to each of 13 categories of spending as well as the percentages of projected revenue received assigned to each category. The county’s position now is that the percentage figures are not what control spending. Rather the dollar amounts are what are important, if the county is able to collect the projected $55.6 million. Of the $55.6 million projected to be collected in SPLOST 2015, $47.3 million will go to county projects, $4.8 million will go to the city of Watkinsville, $1.5 million will go to Bogart, $1 million will go to North High Shoals, and $0.3 million will go to Bishop. The state takes the remainder for administration of the tax. The cities set their priorities for how the money allocated to them will be spent. Watkinsville focused on streets, Bogart on streets and sewers, North High Shoals on streets, and Bishop on renovation of Town Hall. The Board of Commissioners focused on the $55.6 million target figure as it whittled down more than $100 million in requests in four public hearings and two work sessions since the first of the year. Since the county was to get only $47.3 million of that, the BOC had to balance out the appeal of requests as large as $25 million for a new judicial facility to as small as $55,000 for a van for the coroner. In the end, neither of these requests were funded, and the BOC decided to spend heavily on water and sewers, roads, and parks and recreation. Public response was most vocal in support of parks and recreation. The goal of the BOC is to create a list of projects that is likely to generate support from people with different interests who will come together to provide a majority of the county’s voters when the ballots are counted. During the preparation for SPLOST 2015, the BOC decided to take $2.1 million originally allocated in SPLOST 2009 out of the water and sewer category and use it to pay off the debt for the jail. The argument from County Attorney Daniel Haygood was that the county could do whatever it wanted with allocations from 2009 since it is unlikely the county will collect all of the money projected from the tax. The only limitation, Haygood said, was that the county could not decided to provide zero funding for any of the listed categories. Finance Director Geddings said he expected the county to collect about 82 percent of the projected $40.4 million. If the county gets the average revenue based on the last eight months in the remaining 13 months, it will collect $32.3 million, or 80.1 percent of projection. If the county gets the average growth rate of 1.51 percent for the remaining 13 months, it will collect $33.8 million by the end of the third quarter of next year, when SPLOST 2009 expires, or 84.5 percent of projection. The county had its best single month in January of this year, for December sales, when it received $577,686. So far, the SPLOST referendum has generated little public response. At the meeting of the Oconee County Industrial Development Authority on Sept. 8, member Ed Perkins said “it is really important...that this SPLOST is approved by the electorate” and he asked what the Authority could do to bring that about. He was immediately cautioned by ex-officio IDA member Melvin Davis, chairman of the Oconee County Board of Commissioners, that the IDA could not spend any money promoting the tax. The 2015 SPLOST project list includes $850,000 for “Economic Development Facilities.” The BOC earmarked that amount to the IDA in its work sessions on the project list. Keller told the Industrial Development Authority that the Chamber will work for passage of the tax through advertisements it intends to place in the county’s two weekly newspapers and through yard signs. In an email message she sent me on Friday, Keller said she also will use the Chamber newsletter to reach members and to promote the tax. Keller said the newspaper advertisements will run in October. SPLOST is a tax on consumers, and it has generated no public negative reaction from those consumers so far. SPLOST is part of a complex set of sales taxes collected in the county. The state of Georgia collects a 4 percent sales tax on purchases at retail outlets in the state. Oconee County collects an additional sales tax of 1 percent. This tax is called a Local Option Sales Tax. The funds go into the county’s general fund, and the tax remains in place unless the county were to decide to remove it. Oconee County also collects a 1 percent sales tax for education, referred to as Education Local Option Sales Tax. That tax expires unless renewed by voters after a specified period of time. The final local sales tax is SPLOST, which has to be renewed every six years and can only be used for capital outlay projects. SPLOST cannot be used for operating expenses or maintenance. That tax also is 1 percent. The local sales taxes, including SPLOST, are imposed on the sales of food and beverages, which are exempt from the state tax unless the food and beverages are described as prepared for consumption. I don't know how I'm going to vote on this. I don't trust the commissioners. I suspect they will do their own thing for the most part and not follow the list. I would rather have a 2% tax going to the general fund. That way we would know how the money was spent. It is almost impossible to keep tract of what is happening with the SPLOST funds. A competent county administration would have all SPLOST spending easily available on the county website, updated monthly at the least.